Press the “Uninstall” button. 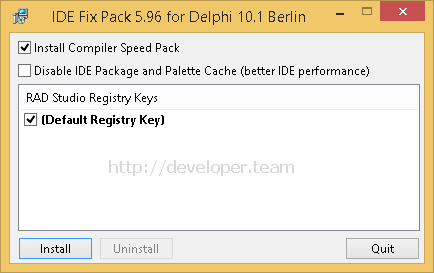 This will uninstall the bugfix for all (not only the selected) IDE registry keys. Using fastdcc directly Extract the 7z file into your $(BDS)\bin directory. Replacing dcc32.exe by fastdcc32.exe (don’t do this if you want to be able to install future RAD Studio/Delphi/C++Builder updates) Extract the 7z file into your $(BDS)\bin directory.